Deborah Milano Black Pochette is an elegant black fabric pochette sporting gold flecks and trimmings. Give your eyes a dramatic look on the go with Extraordinary 5-In-1 Mascara + Black Eyeliner Eye Pencil in this pochette. 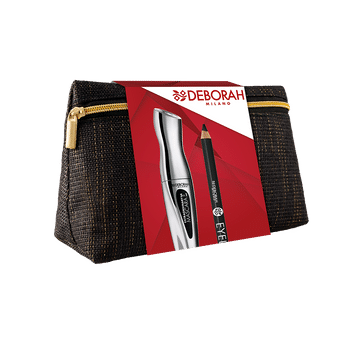 Deborah Milano Extraordinary 5-In-1 Mascara (12 ml): Mascara with an innovative 5in1 formula for a volumizing, extending, curling, long-lasting and high-definition effect. The slender brush, ideal for long and short eyelashes, gives volume, definition and allows you to push the lashes upwards for greater curvature. Deborah Milano Black Eyeliner Eye Pencil (1.3 gm):A comfortable pencil for a clean and precise contour, it releases a pure and intense color with a long seal. This soft and flowing texture guarantees a feeling of absolute comfort. Additional Information: Italy's leading make- up brand, Deborah Milano embodies Italian excellence since 1962. For over 50 years Deborah Milano has been making beauty an affordable and accessible pleasure for all women. Combining a flair for colour, latest trends and a focus on quality certified by the Deborah Group's own research laboratories, the brand's eye catching designs, attention to detail and unmistakably Italian flavor have become its hallmarks.